Some friends living abroad say it’s difficult to give an opinion about Venezuela. However, left-wing Latin American friends have no problem with taking sides: “I agree with Chavismo because I’m left-wing”, period. Yet, a left-wing Brazilian friend once said to me, “I support the Chavez regime, but the truth is that I would not like it for my country”. 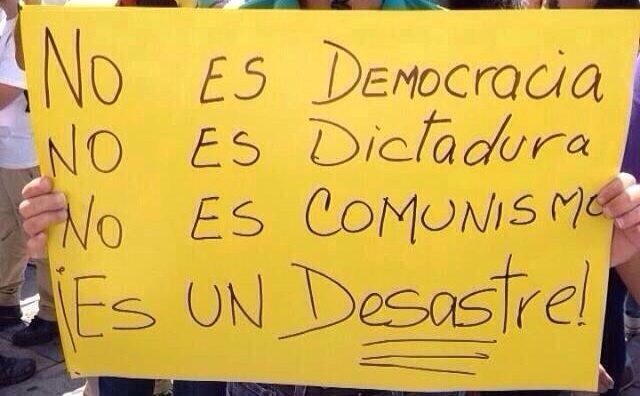 “Left-wing/right-wing”, “fascists/revolutionaries”, “Chavistas/opposition”, “the oligarchy/the people”, “patriots/traitors”; these are the dichotomies tirelessly repeated in the past 15 years, until finally someone says, “Venezuela is neither one nor the other, but quite the opposite”. The division of the country, from which this government has greatly benefited, has rendered this complexity difficult to understand. But the most regrettable aspect of this is to see the Latin American academic left wing also assume this dichotomised conceptualization while unable to apply to the Venezuelan reality what is proclaimed in their lectures: the need to employ transdisciplinary approaches in order to understand processes. As Rafael Cadenas, one of our great poets, says, “pluralism lives under threat from fanatics of all sorts”. However, not all Chavistas are left wing, and not all right wing people are in the opposition. Among the chavistas there is a contingent of the population that benefits from the redistribution policies and is key to their client-based structure. But there are other Chavistas –who define themselves as revolutionaries– including (a) an opportunistic and corrupt sector that has become enormously rich, the so-called “boli-burgueses” (the Bolivarian bourgeoisie); (b) a group of old Marxists who do not want to understand that the USSR was a failure; (c) those that can be described as the welfare-oriented left wing that enjoy privileges they never had before; and (d) a sector which continues to believe that the economic model where the government manages the oil revenues as it sees fit is indefinitely sustainable. Among the opposition, besides a radical right wing (that has done a lot of damage to the democratic opposition), you also find: (a) a working middle class that believes in meritocracy as a legitimate way to progress in society; (b) a business sector that understood the importance of social responsibility; (c) a sector that has historically been left wing and include a significant part of trade unions, autonomous public universities, a large number of artists and the majority of the most productive researchers in all areas of knowledge. On the other hand, the opposition is composed of a variety of political parties, including left wing ones, as well as of grassroots and social movements, NGOs, and Foundations, which are not right wing. There are also emblematic characters with impeccable left-wing record and a track record of political struggle for democracy. Other categories may also be considered, but what I now want to emphasize is the diversity, in contrast with what is perceived from outside Venezuela in the reductionism of dichotomous categories, binary approaches, often outdated, that distort the particular complexity of the difficult Venezuelan situation. But aside from the above, the Latin American academic left wing has never stopped to wonder why such a large proportion of left-wing Venezuelan academics has raised serious criticisms of this process. The Venezuelan academic left wing has always been very critical of any single minded approach: be it Chavista or neoliberal. It is extremely important for the Latin American academia to address the complexity of Venezuelan reality. We need to overcome the lack of communication and understanding in order to better grasp a reality that is very far from being black and white. It is more urgent for academia to contribute to a dialogue by providing knowledge with the objective of building bridges between the Chavista democratic sectors and the opposition rather than making written statements that tend to further reinforce the polarization. I am particularly referring to the Declaration of a Latin American Social Sciences agency, which seems more like a document from a political party than from a social science organization. It takes a forthright stand in favor of the government, without considering the investigations carried out in Venezuela, including those conducted by researchers that are members of the organization itself. Such research has shown the weaknesses and mistakes of this government. Furthermore, the style of the declaration resembles that of an undemocratic political party, given that the application for the right to reply filed by a group of Latin American researchers members of this organization was not placed on the internet site where the directive’s Declaration had been located, as requested by the group that signed the application to lodge a reply. (http://polisfmires.blogspot.com/2014/02/solicitud-de-derecho-replicas-de.html). I wonder if that conduct is adequate for a regional organization of social sciences that should be pluralist, as the behavior of this kind of organizations in Latin America has historically been, thereby respecting the differing schools of thought that are expressed within these institutions. These statements, I repeat, are certainly not helping to improve the understanding of the complexity of what is happening in Venezuela. On the contrary, they enhance the polarization and the impossibility of changing the single minded attitudes. As it stands now, without realizing it, the situation in Venezuela could take a dramatic turn, the most extreme being: – a more authoritarian Chavista government repressing the half of the country that remains anti-Chavista; – a coup d’état; – a civil war.